Cyclone's boom snapped in two on Sunday night during a severe storm, just north of Sleeping Bear Bay in Michigan. 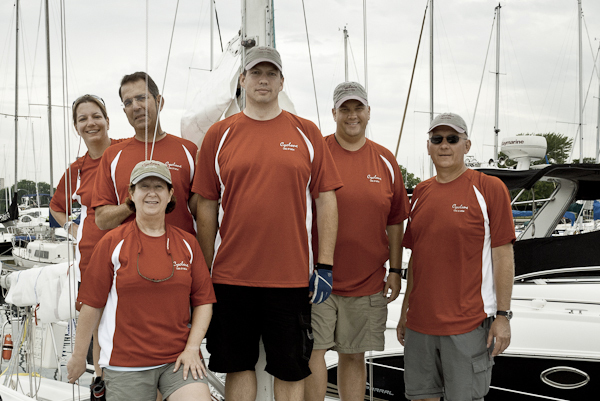 The crew pulled into the harbor in Leland, MI early Monday morning. Another sailboat in the harbor had lost its mast in the same storm. More details forthcoming. head on the now broken boom (top right). Cyclone is in Section 7, sail number 51804. We will also try and post on Facebook in the Cyclone J92 group. This one is data access dependent as cell phone coverage gets spotty once we get a few miles from shore, if we have access we will try and post some stuff and you can cheer us on there. This past weekend we got a pantload done. 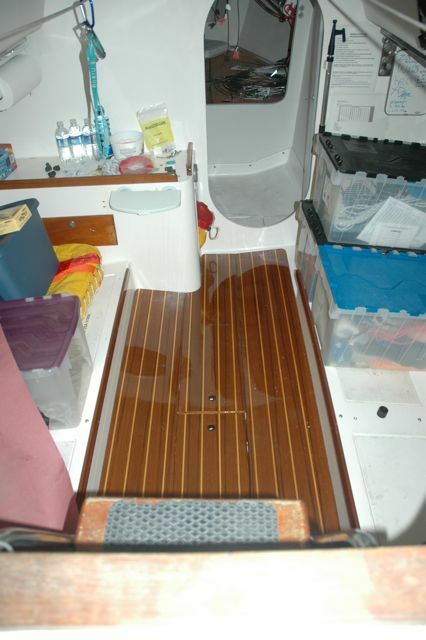 Hull is waxed, bow eye is installed, drive shaft work is done, boat is loaded and new floor is installed, holy crap does that new floor shine. The boat is ready to be launched. Thanks to Navbob, JohnF and NancyS who are this springs MVS's (Most Valuable Sailors). This weekend I have a few small projects but I will not need any help, if you want to hang out for an hour or two and help me tinker then meet me at the boat yard Saturday morning at 9:00 am. This weekends project is some minor tiller work, last min checks, fill the cooler and "medicine chest" and remove the ladder. The ladder looked OK with the old floor but with the new floor in the ladder desperately needs some freshening up and yes fixing the loose bottom step will happen. Thanks to your help Cyclone will be the prettiest girl at the ball. The launch is scheduled for Friday May 20th and the river trip is Saturday May 21st with the first rain date of May 22nd. First race will be Wednesday May 25th. If you can't wait to get on the water I will be doing RC duty on Wednesday May 18th for the Crew School Race. Come hangout and play with some powerboats. Please use crew signup to let me know your availability. Me: I am trying to figure out a date when I can launch my boat, it's blocked in pretty good. Boatyard: It can go in any time, just let us know. Boatyard: Let me check, (long pause) Oh you are in the back.